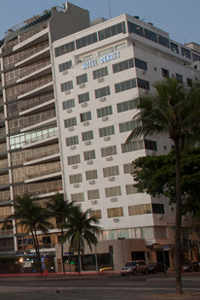 The Plaza Copacabana Hotel is located within walking distance of the beach, cinemas, theatres and shopping malls. Surrounded by Copacabana's exciting nightlife, it offers easy access to downtown, the Domestic Airport and Rio's International Airport. In the hotels 237 apartments and suites, you will find modern facilities, besides excellent service. The Plaza Copacabana's restaurant serves one of the best executive buffets in Rio de Janeiro. It offers various sophisticated dishes like a la carte, international and Brazilian cuisine. When would you like to stay at Windsor Plaza Hotel ? 1) Rates at the Windsor Plaza Hotel may not be valid during Carnival, New Years, Easter and other special dates.